Whilst browsing the Twitter airwaves last week I discovered ‘Finish it Feb’ – a month long event where you aim to read as many unfinished books and series that you can. Perfect – I have a whole heap of those books! Also I approve of the alliteration. Thinking about it, more months should really have alliterated book theme events to encourage you to read more – Micheal Morpurgo March anyone? Science Fiction September? Dystopian and Death December? I’ve been realistic with my goals – I aim to complete one book in a series and two new books! Last year when travelling and had left London I really got into a book series by Ben Aaronovitch set in London, which made me miss it even more! The series is about a policeman – Peter Grant, who works for an undercover branch of the Metropolitan Police that deals with magic and the supernatural! So good! I’ve read three of the books in the ‘Peter Grant a.k.a Rivers of London series’ – Rivers of London, Moon Over Soho and Whispers Underground. That means there’s 3.5 books (the 0.5 is a short story set in London Olympics 2012) left to read in the series atm. 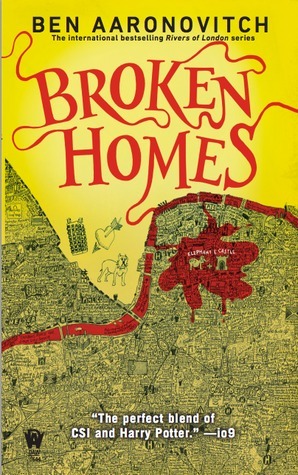 So my aim is to finish book no.4 Broken Homes, which I will be reading via listening on audible. I really got into audible when I was travelling, mainly because I did a lot of coach/bus/train/plane journeys and I suffer badly from travel sickness. I find audio books a good way of distracting me from sickness and keeping me entertained. Now I am back at home I save the audio books for my work commute and washing up. My washing up has never been so thorough!